Titan’s venture, Taneira is an ethnic brand that’s bringing together classic Indian weaves, looms and sarees from all over the country. Saree shopping for the wedding trousseau or just picking up an elegant piece for an upcoming family function? Then head to Taneira in Indiranagar as they stock up on some gorgeous yardage. 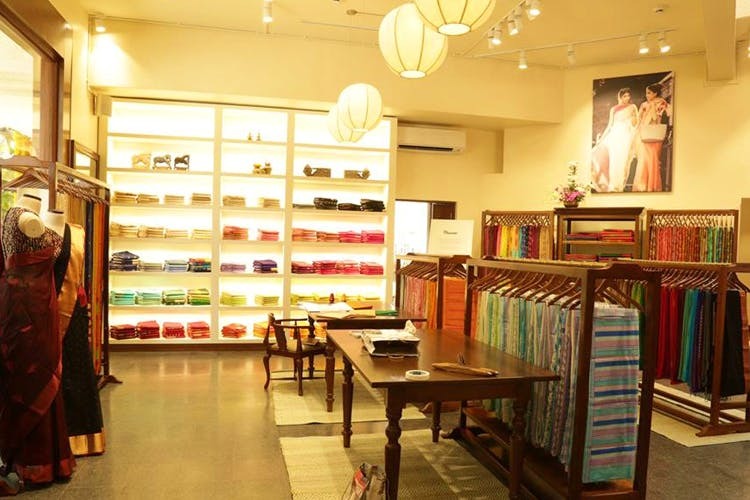 The lavish store in Indiranagar (they have one in Jayanagar too) is spread across two floors, with a separate set up or section for each kind of weave or loom. Walking through the store is like taking a trip through different parts of the country through its colourful handcrafted weaves and textile heritage. With a corner full of Bengali looms and another with Chanderi sarees, and a board with a brief description of the weave on them, sift through the best textiles that the country has to offer with a quick history lesson to go along with it in one spot. You can find Ikat, Bandhini, Ajrakh, Chikankari, Kanjivaram, Banarasi and more such classic Indian textiles and sarees here. It’s not just sarees they have on their shelves; lehengas, dupattas, stoles, long skirts and saree blouses also find a spot here. Well within your wallet's reach, prices start at a reasonable INR 1,100 for cotton sarees. With plenty of seating, informed sales staff, big changing rooms and even a cafe to refuel at (we know shopping can get exhausting) with quick bites like samosas and sandwiches to munch on, you can make a day of shopping at their store. There’s plenty of people here to assist you and patiently take you through the collection, which, as we’ve established, is quite extensive. You’re very likely to find stuff to add to your ethnic wardrobe here. So hit them up and look like a million bucks at your next big function. Taneira also hosts fun events at their stores. Catch their next one by following them on their social media handles.